Every year countless people make resolutions to drink less, eat less, and build a healthier diet. But just because people claim they want to doesn’t mean they will. Talk and intentions don’t always translate easily to action, but action is really the only thing that gets results. When people stick to a plan and work hard, their efforts are often measurable. But people can sabotage their best intentions quite easily. For example, they might not know how to properly eat “healthy.” They might feel that because they are purchasing or consuming more healthy foods, it offsets a jump in snacking. Whatever the reasons are, people don’t seem to stick to their New Year’s resolutions of eating better even if they believe they are—and as the saying goes, the proof is in the pudding. A study appearing in last December’s issue of PLOS One, a peer-reviewed scientific journal, showed that people actually spend more on food in the early part of the year than they do during the rest of the year—even the holidays. And they’re not just spending more, but their carts are filled with more calories! If you ask the average person on the street when they eat the most, they’ll likely say the holidays, between Thanksgiving and New Year’s. That’s when all the dinner parties, big elaborate meals, and tasty treats come out. But this new study is showing that food spending actually spikes in the months following the holidays, which leads to increased consumption—the exact opposite of what most people are trying to accomplish in the New Year. 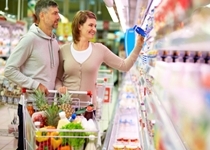 Researchers tracked the spending habits of 207 households buying groceries from a northeastern grocery store between July 2010 and March 2011. After accounting for regular, baseline spending and calories, the researchers found that holiday consumption increased by 440 calories per week. After the holidays and in the early part of the New Year, however, there were an additional 890 calories in shopping carts per week! The study showed that yes, people were spending more on healthy food, but they were also purchasing far more calories in general. This tends to lead itself to the idea that people are simply adding some healthy options to an otherwise unhealthy diet. For example, people may be purchasing more fruits, vegetables, and unprocessed foods, but if you’re simply adding some red peppers and kale to your bologna sandwich on white bread, you’re really not making any improvements to your diet. Adding some healthy items to an unhealthy diet isn’t the way to a better diet and overall health; eating healthy involves constructing meals that are composed entirely of healthy options. It’s also possible that people are using a low-calorie (or calorie-efficient) meal to justify an unhealthy indulgence later on. For example, a healthy breakfast and a grilled chicken and veggie salad for lunch might let people believe that a frozen pizza and two scoops of ice cream is a deserved daily reward for their healthy eating earlier in the day. So when you might think you’re reaching your goals by eating better a few meals a day, you’re actually sabotaging them by overindulging later—and you may not really recognize the error. A couple of slices of frozen pizza and a scoop of ice cream might be a nice treat once a week or so, but the calories can add up fast when consumed regularly. In addition to a big jump in total calories, people were spending more money, too. This shows me that they’re likely buying packaged foods labeled “organic” and “gluten-free,” or other pricier options based on trends. For the most part, these more expensive items offer no additional nutritional value, so sticking to traditional whole grains, fruits, and vegetables is recommended if you’re on a budget or looking to save some money. By selecting these cheaper options, you can save all kinds of money. The only boost might come from your protein sources, where fresh chicken breasts, turkey breasts, and lean cuts of red meat are more expensive than boxed burgers or chicken fingers, but these unprocessed foods are worth the splurge. If you’re trying to eat better this year, make a real effort to leave the junk food on the store shelves and read labels of any packaged food you buy. You probably have a pretty good idea about what’s good for you and what’s bad—like you know a burger and fries covered in ketchup isn’t the same as a grilled chicken sandwich on a whole grain bun with a side salad. You know what junk food is, so don’t buy too much of it. The more of it sitting around the house, the more likely you are to eat it. A good strategy I’ve found for junk snacks is to keep none in the house. If I’m craving something sweet, I consider whether or not I deserve it before I go purchase it at that time. I encourage you to do the same. If you’ve been eating well the past three or four days for nearly every meal and you’re really craving a candy bar, ice cream, or desert, then go to the variety store and buy a single serving. This way you can control your portion size and treat yourself without sabotaging your efforts! But remember to save these small treats for once or twice a week, tops! Only you can turn your intentions into actions that produce results. If you want to eat better this year, then make an effort to change how you eat and don’t just add a couple of better options to a poor diet. Pope, L., et al., “New Year’s Re-Illusions: Food Shopping in the New Year Competes with Healthy Intentions,” PLOS One web site, December 16, 2014; http://journals.plos.org/plosone/article?id=10.1371/journal.pone.0110561, last accessed January 15, 2015.